Teamwork and collaboration are at the heart of work in academia and industry. However, collaborating and communicating in high-stress situations is difficult for teams of all sizes. In this evening workshop Lukas Bühler, head of ETH Week and founder of Zum guten Heinrich, will share his experiences around teamwork in a startup. 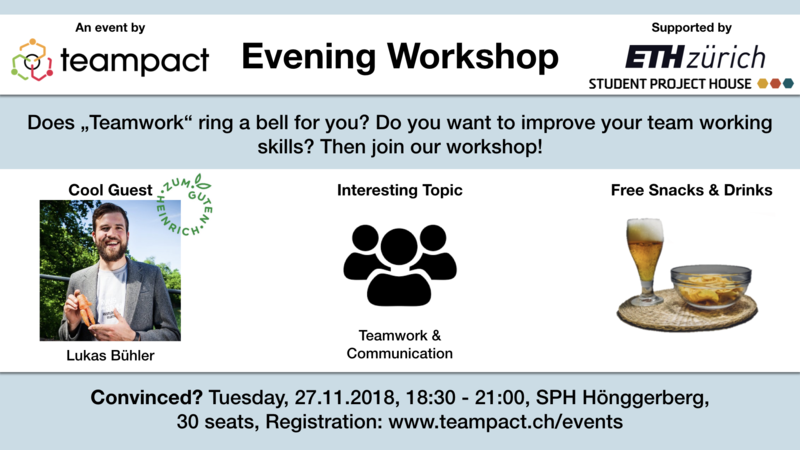 Afterwards, teampact will put the collaboration concepts to test in an interactive workshop centered around team communication. Lukas is an ETH-trained climate scientist and a food waste expert for the Swiss Radio and Television SRF. His passion for fighting food waste lead to him co-founding “Zum guten Heinrich”, a startup that provides sustainable catering services that don’t waste food. Please register for this event by using the form below. This event is organized by teampact with support of Student Project House and ETH‘s Critical Thinking Initiative.